Buttons, ports and speaker grills are absent from Vivo's Apex 2019 concept phone, which is wrapped in a single piece of glass. Chinese electronics company Vivo created the unibody smartphone to give consumers "a glimpse into the future of smartphone design" where both look and functionality are streamlined. It showed off a unibody prototype made of its distinctive curved "Waterdrop Glass" at a launch event in Hong Kong this week. Although many contemporary smartphones feature glass on both the front and back, Vivo had to develop several new technologies to completely eliminate the usual openings, seams and bezels – the frame surrounding the screen. The glass itself is the speaker, vibrating to produce sound and avoiding the need for a grill. Instead of physical buttons, the Apex 2019 uses a combination of capacitive touch and pressure-sensing. Users can sleep or wake up the phone or change the volume by pressing on the sides of the glass where the bezel would usually be. Additionally, the full screen is embedded with fingerprint scanners. That not only means that users can unlock the phone with a natural touch to any part of the display, but that they can open an app and securely log into it with one simple press. Vivo also boasts a Fingerprint Light function, which lights up nearby pixels when a finger is close to the display. This additional light source helps with obtaining a clear fingerprint reading. 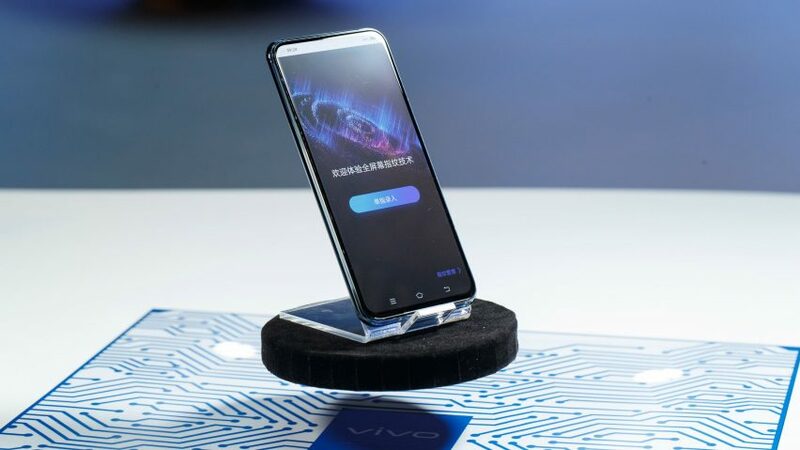 While many contemporary smartphones have wireless charging and data transfer capabilities, Vivo opts to do this magnetically, using a connector of its own development called the MagPort. This clips magnetically onto the back of the phone, eliminating the need for ports. Although there are no plans to bring this version of the Apex 2019 to market, the concept project is meant to hint at Vivo designs to come. It previously turned its 2018 Apex concept into a mass-produced phone, the Vivo Nex. "With the goal of enhanced usability and simplicity at the core, APEX 2019 offers consumers a glimpse into the future of smartphone design and development," said Vivo senior vice-president Spark Ni. "The Super Unibody design and Full-Display Fingerprint Scanning technology, among several other breakthrough features, make APEX 2019 a truly exceptional smartphone that demonstrates Vivo's continuous exploration and pursuit of exceptional innovation for consumers." The Apex 2019 is a 5G smartphone with 512 gigabytes of memory, a Qualcomm Snapdragon 855 processor with 12GB RAM, and built-in Jovi AI Assistant. Headquartered in Dongguan, China, Vivo was founded in 2009 and is currently one of the largest smartphone companies in the world. This year's other smartphone innovations have mostly been in the form of foldable screens, with both Samsung and Huawei unveiling their much-anticipated designs at the recent Mobile World Congress.